I have started a regular grain and sugar free cooking column for the online magazine Blogcritics. This is the first article I published for that column. 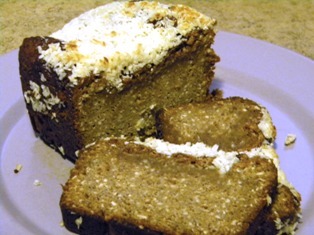 Article first published as Gluten Free Lime and Coconut Banana Bread on Blogcritics. I have a delicious gluten-free banana bread recipe that will blow you away. This recipe uses peanut flour in place of regular wheat flour. Peanut is a good gluten-free alternative for baked goods. Peanut flour is very fine and can be used in the same measurement of the amount of flour called for in a recipe. Peanut flour can be hard to find but specialty stores such as Trader Joe’s carry it. It can also be ordered online. Honey is used as the sweetener in this recipe. Honey is a little bit sweeter than sugar, so less honey can be used relative to the amount of sugar called for. Peanut flour may seem like an unusual choice for gluten-free cooking. It is not commonly used, and as I mentioned above, not necessarily the easiest flour to find. It is a great flour for special occasions because the consistency of the baked good is closer to its wheat flour counterpart than other gluten-free flours I have tried. The flour is very light compared with almond flour, which makes it a good choice for cakes. The flavor desired is another factor in choosing peanut flour. It needs to be used with a complimentary flavor. It might not work as well for a lemon cake, or a basic yellow cake, but it is great for spice cakes, apple cakes, or banana cake or bread, as seen in the recipe below. 1. Preheat oven to 350°. Line the bottom of a bread pan with parchment paper and grease the sides. Combine the peanut flour, baking soda, and salt, and coconut into a large bowl. Mix thoroughly. 2. In a separate bowl mash banana and mix in butter, vanilla, yogurt, vinegar, and lime juice. Blend for about two minutes. 3. Slowly add in the almond flour mixture while blending at a low speed. Blend for about a minute until everything is combined, but be careful not to over-mix. 4. Bake for sixty to seventy minutes until a knife inserted in the middle comes out clean. Allow to cool for 15 to 20 minutes before adding the topping. 5. Prepare the topping while the bread is cooling. Stir all the ingredients together and allow to sit for about 20 minutes. When the bread is ready, spread topping over the top. Place under a broiler for 2 ½ to 3 minutes to brown the coconut. Keep a close eye on it because the coconut can burn easily. 6. Allow the bread to cool for another 15 – 20 minutes before removing from pan.